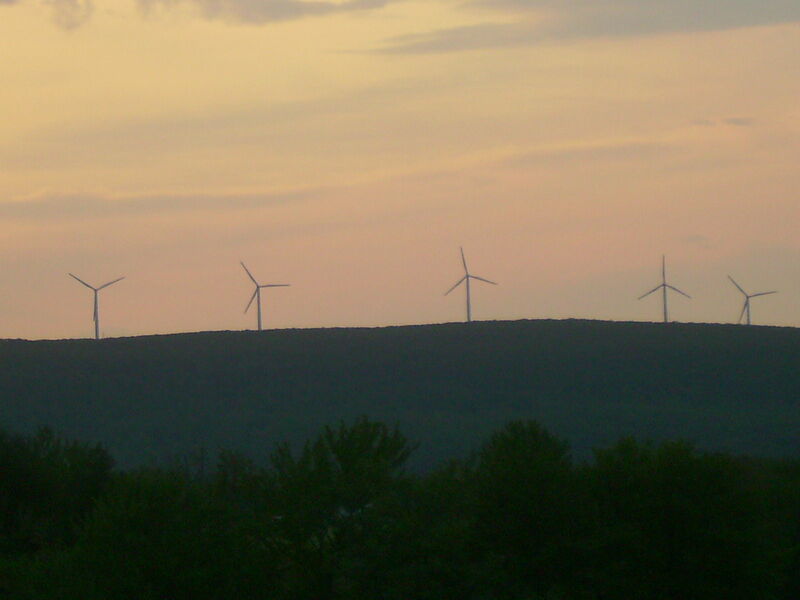 Wind turbines in the Poconos, Pennsylvania. Photo credit Mitchazenia/Wikimedia Commons. It had begun to look like no one would ever build a wind farm on land in Virginia. Appalachian Power Company (APCo) hasn’t shown interest since the State Corporation Commission bounced its proposal for West Virginia wind farms several years ago. Just this past November, Dominion Resources let it be known the company saw no future in land-based wind. One after the other, wind development companies put their Virginia plans on hold, citing permitting issues, anti-wind local ordinances, and—especially—a challenging policy environment. But interest in Virginia wind never went away, and now Charlottesville-based Apex Clean Energy is pushing ahead with plans for up to 25 turbines on a tract of private land in Botetourt County, 30 miles north of Roanoke. Although development is still in the early stages, the company expects construction to take place in 2017, with electricity flowing that same year. Apex has years of experience developing wind farms across the country, but this would be its first venture in its home state. The timing seems good; the EPA Clean Power Plan will make renewable energy more valuable to utilities and state officials, and wind energy costs have grown more competitive every year. And while previous wind farm proposals in Virginia have run into opposition from landowners and others, Botetourt County officials unanimously passed a wind ordinance that will allow the project to move forward, with public backing that included an endorsement from the Roanoke Group of the Sierra Club. Yet anyone who has followed the fates of previous wind farm proposals has to wonder whether Apex can succeed where others have failed. With that in mind, I talked with Apex’s Tyson Utt, Director of Development for the Mid-Atlantic, to gage just how likely we are to see turbines up and running two years from now. Utt explained that the project is still in the design phase, so a lot of the pieces still have to fall into place. Studies are ongoing to determine the optimal size, type and number of turbines. The project could be as large as 80 megawatts (MW), enough to power up to 20,000 homes, and would represent an investment of up to $150 million. A transmission line crosses the site, and Apex is working with Dominion to ensure grid access. Apex has not lined up a buyer for the electricity at this stage. Utt said options would include a power purchase agreement (PPA) or sale of the completed project to a utility such as Dominion or APCo. Other possibilities include striking a deal with a corporation that wants to buy wind energy, as Apex has done with Ikea in Illinois and Texas. Recent events suggest the utilities could be persuaded to take a close look. APCo’s 2015 Integrated Resource Plan (IRP) lists wind energy as a low-cost option for complying with the Clean Power Plan. And Dominion, in spite of all-but-dismissing wind in its own IRP, is still pushing aggressively for the right to put turbines on land it owns in Tazewell County. So almost my first question to Utt was how he thought Rocky Forge could produce power at a competitive price. Utt acknowledged the challenge posed by the loss of the PTC but insisted that even in Virginia, wind power can be competitive so long as there is some mechanism that levels the playing field with fossil fuels. If it’s not the PTC, he said, perhaps it will be Master Limited Partnerships, which currently offer tax advantages for development of oil and gas but not for wind and solar. Sales of Renewable Energy Certificates will also help bridge the money gap. Public acceptance of wind energy can’t be taken for granted in Virginia, but the Rocky Forge site may be as good as it gets here. Much of the area where the turbines will go has been previously cleared, and the land is privately owned. The nearest home is a mile and a half away, and a high-voltage transmission line already crosses the property. No bald eagle nests have been found within a four-mile buffer area, and Utt said the company has had biologists on site every two weeks to study wildlife issues. More seriously, opponents cite concerns about birds and bats. Studies have shown that wind turbines are a relatively minor cause of bird deaths compared to the other ways we humans kill birds (windows, wires, vehicles, pesticides and letting Kitty out the door), but bat mortality is a real concern in the Appalachian Mountains. Utt said he felt the wind industry has learned a great deal about building turbines in bat areas in recent years. Apex will include mitigation measures in its operating plan, such as shutting down the turbines at low wind speeds and during key migration times. Apex’s proactive approach to wildlife issues, and its early engagement with local residents going back many months, helped it win over local officials and environmental activists. Dan Crawford, the chair of the Roanoke Group of the Sierra Club, invited Apex employees to give a presentation about the project in early May, and the group ended up endorsing the proposal. The Sierra Club had supported a previous effort to build a wind farm on Poor Mountain, which stalled in 2012 when developer Invenergy gave up on Virginia. The Sierra Club supports appropriately-sited wind farms as part of America’s transition from fossil fuels to clean energy. Crawford says he is hopeful now that the Apex project will move forward. *Update: Later on July 13, the buyer was revealed to be Amazon Web Services. Anybody notice a trend?